The broadly versatile musical career of American violinist Amy Schwartz Moretti spans nearly two decades. Former concertmaster of the Oregon Symphony and Florida Orchestra, she has been guest concertmaster for the symphony orchestras of Pittsburgh, Atlanta, CityMusic Cleveland, New York, and Hawaii Pops, and festival orchestras of Brevard, Colorado, and Grand Teton. Director of the McDuffie Center for Strings since its inception at Mercer University’s Townsend School of Music, she has developed the Fabian Concert Series and holds the Caroline Paul King Chair in Strings. Her dedication to collaboration and performance complements her directorship and inspires her teaching of the Center’s gifted musicians. 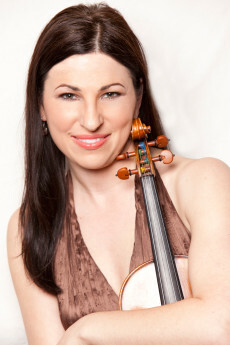 Ms. Moretti maintains an active schedule of solo and chamber music performances and is a member of the Ehnes Quartet. The Cleveland Institute of Music recognized her with an Alumni Achievement Award and she is the 2014 San Francisco Conservatory of Music Fanfare Honoree. Through the generosity of the Stradivari Society, she plays a 1744 G. B. Guadagnini violin.